The Fight For My Way production has given us so many looks at Dong-man’s signature kick, it’s ridiculous. The kick that almost got him on the Korean nation team. The kick that made Coach-nim follow him around for 10 years. The kick that is going to make him faaaamouuuuuus. Let’s break it down shall we? To set up his kick, he first needs to get his opponent off-balance. This can happen in one of two ways. First his opponent can get himself off-balance through whatever reason. And second, Dong-man can get his opponent off-balance. Dong-man’s favorite weapon to get his opponent off-balance is through using a roundhouse kick to the obliques. 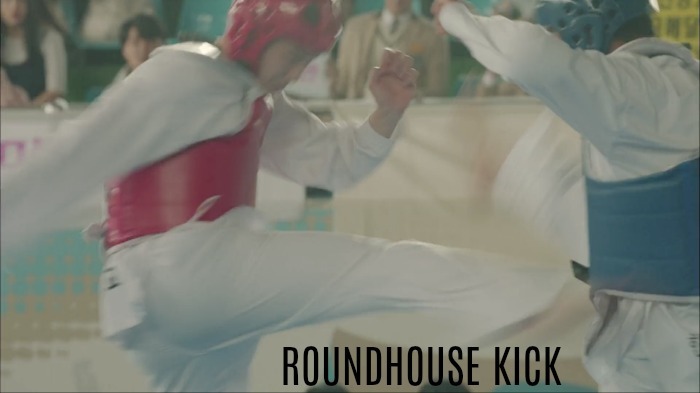 Once he does the roundhouse kick to the side, it get his opponent to react and either block the kick or get hit and bend over at the waist. Either way, their balance shifts onto their back foot. 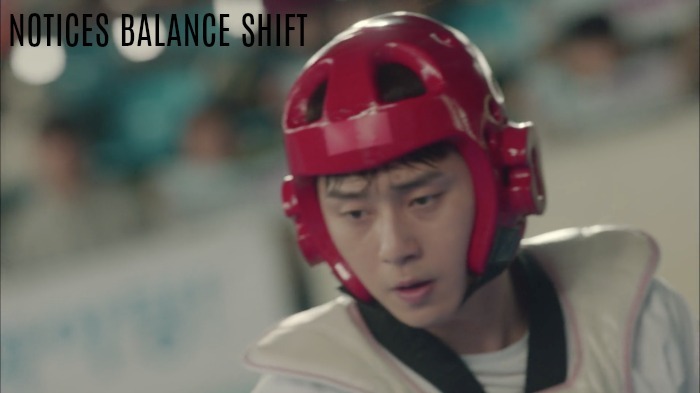 As said, this balance shift can happen by the fighter himself, such as if he hops back, as we saw with Dong-man’s début opponent in episode 8. Step 2: Noticing the shift in balance. Now here is where Dong-man is special. Dong-man is an expert at distance, timing, and in noticing balance shifts. Once he sees that his opponent is off-balance or putting all his weight on his back leg, he capitalizes on it right away. 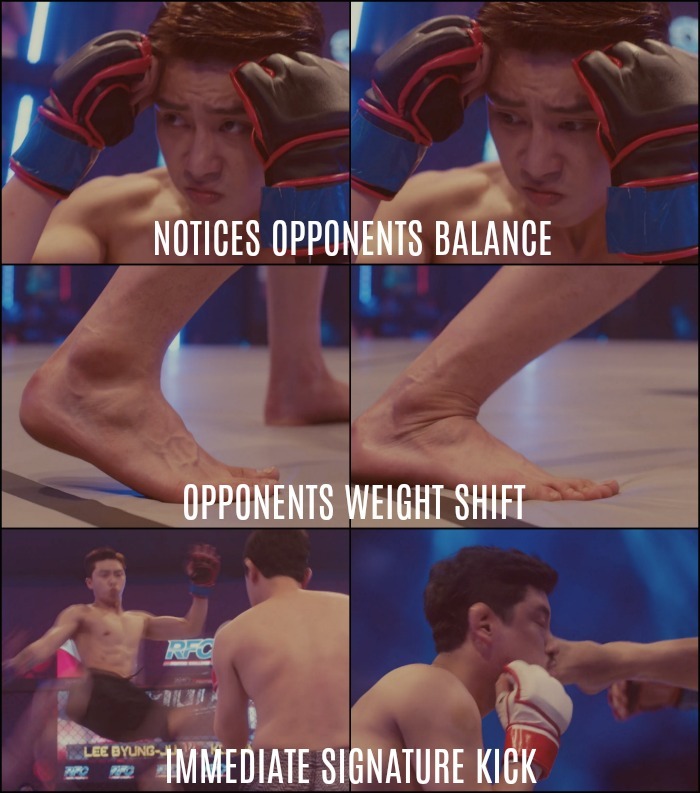 In all of the times we have seen Dong-man in action with his signature kick, they always show him noticing this balance shift in his opponent. I think they might show us this to help us realize what makes Dong-man so special as a fighter. He acts! Once he notices something, he doesn’t wait around to see if his opponent will recover or do something or whatever, he just acts. I think this is why Coach-nim always tells him his brain is not for thinking – it is for doing. Step 3: Wide stance/Switch stance. This step happens quick, you need to pay attention to notice it. Once he notices the shift in weight, he immediately moves into his signature 540 kick. The first step in this kick is a wide stance with his left foot forward and his right foot back. When he is in that position, he quickly shifts his weight and moves right into the next step. Step 4: Back foot pivot. Step 4 is a pivot of his back foot to set up his spin. This part is important because it is the start of the torque that will give his kick all of it’s power. It is also a step that the production shows us time and time again. 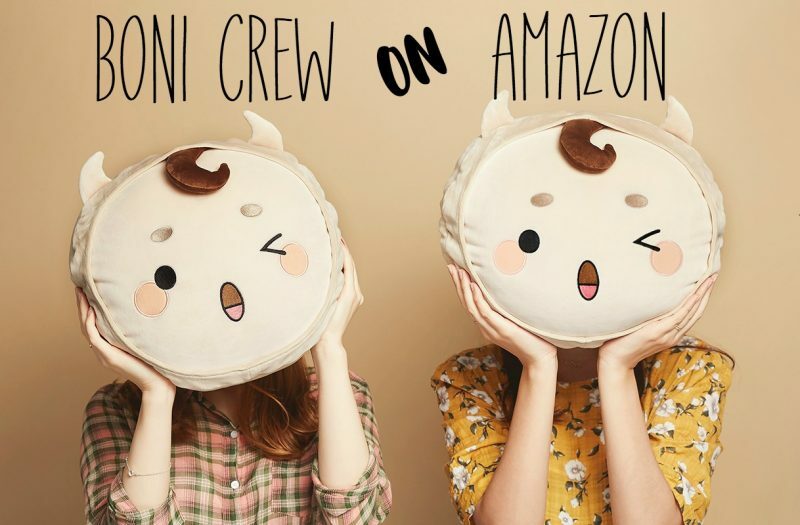 They basically scream it at us. LOOK AT THE BACK FOOT PIVOT. Step 5: Bending his knee and spinning into the 540. Step 5 he immediately torques his entire body into the 540 spin and fully commits to it. His attention is always present and when he turns his head around he sees his target, his opponent’s head. Step 6: Landing his kick. He flies through the 540 and lands the kick flush onto his opponents face, knocking them out. This is also showing us Dong-man’s ability in gauging distance. Too close and his kick won’t have the impact to knock out his opponent. Too far away and his foot might just sail by his opponents face or just graze it. Both aren’t good, he is looking for the knockout sweet spot and he is the best in the world at this one thing. Step 7: Spinning back to attention. This part is more a bit of flair. After landing his kick he spins back into attention to see if his opponent is out. They are, of course, because this is the kick that will bring in the dough and make him faaaaamouuuuuus (Oprah voice). Lets see if we see it in episode 11 and 12! The second time we saw the signature kick in action was in episode 2 right after Dong-man got yelled at by his manager. He saw some kids arguing over getting the last punch of a game and whipped out his kick to shoot them into the bonus round. We most recently saw the signature kick in episode 7 when Dong-man finally got into the cage. 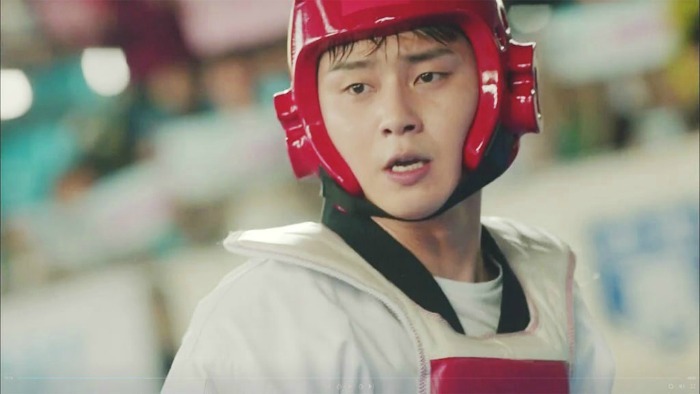 His opponent – non other than his annoying gym mate who has beaten on Dong-man for weeks. But Dong-man notices the fighters weight shift and immediately pulls out his kick from what feels like nowhere. The crowd is stunned. And probably the most dramatic time we have seen the signature kick was against Tak-su after the MMA date with Coach-nim. Dong-man was waiting outside for Coach-nim, but Coach-nim was taking forever to leave. Lo-and-behold, out walks Tak-su. Of course Tak-su starts talking all kinds of trash to Dong-man, but when he mentions Dong-man’s sister – well, that was crossing the line. Dong-man kicks Tak-su with a roundhouse kick and then immediately spins into his signature kick, knocking Tak-su out in front of all the MMA reporters. The video goes viral. Now that the love story is all sewn up (for the most part) I think we will be getting back into the swing of things with our two main leads and their professional lives. Dong-man needs to show the world just how special he is at flying and Ae-ra needs to get a mic in her hand so she can fly as well. I’m ready to get all the side stories all sewn up as well. FULL STEAM AHEAD! Wow! Admin, you show us DM’s signature kick in detail. I wish to see him flyin in coming episodes too. I am too curious with how AR gets her mic! PSJ really acts as a MMA fighter! Can’t wait for ep 11! And also your recap! See You, admin! I am also waiting for sweet moments of DM and AR too!